CBB performs original compositions by bandleader Sam Dechenne. The music is influenced by traditional Eastern European and New Orleans dance songs, Afrobeat, Klezmer and elements of reggae and Western classical pieces. In performance spaces ranging from Balkan Dance festivals across the Northeast, hollowed out warehouses and arts spaces in Boston to the Kennedy Center in D.C., Philadelphia Museum of Art, The Burlington Discover Jazz Festival, WorldFest in Louisville, KY and The Fingerlakes Thaw Festival in Ithaca, Cocek! can be found sprinkling their Phrygian magic dust on audience members all over the world. They also put on programs for schools and universities discussing traditional Balkan/Klezmer & New Orleans Jazz music, it's beautiful history and it's relation to their original compositions. Talk to the abundantly gifted violinist and mandolin player Jason Anick and the phrase "jazz without borders" will invariably come up. What the axiom means to Anick is a contemporary jazz that is stylistically inclusive in nature, a jazz that brings whatever it can to the party, unwilling to cut something out of the mix for fear of it not fitting prescribed boundaries. An inviting demonstration of the maxim in action can be found on Anick's recent release, United, which was picked by Downbeat Magazine as one of the top jazz albums of 2017. One of the youngest violin professors at Boston's Berklee College of Music, Anick is considered "a rising star in the world of jazz violin and mandolin" (Downbeat Magazine). 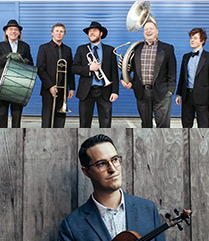 In addition to leading his own contemporary jazz ensemble and performing with the Rhythm Future Quartet, Anick has been touring and recording with Grammy award-winning Nashville guitar virtuoso John Jorgenson since 2008 when he was recruited while still a senior at the Hartt Conservatory. Over the past few years, Jason has been focusing on arranging and composing for the Rhythm Future Quartet, which he started with Finnish guitarist Olli Soikkeli. With performances all over the U.S. and Europe, the Rhythm Future Quartet is rapidly becoming one of the preeminent Gypsy jazz groups in the country. A versatile musician and sought after side-man, Anick has also shared the stage with an array of artist like Stevie Wonder, Tommy Emmanuel, The Jim Kweskin Jug Band, John Sebastian, Delta Rae, and Girls, Guns and Glory. With performances all over the world from China, Europe, and Japan and renowned venues like the Montreal Jazz Festival, Blue Note, Smalls Jazz Club, Scullers Jazz Club, Yoshi's, Iridium, TD Garden, Regattabar, NPR, and The Late Night Show, Jason has proven himself to be a leader in the ever-growing contemporary string world.